Among all the devices running Android OS, the smart phones are the most popular, especially the Android phones marketed by Samsung, HTC, LG, and Sony Ericsson which boast a sleek design, gorgeous HD display and friendly user experience. Watching video on the Android phone is a nice enjoyment except for two things. The first thing is that the Android phone support only limited video formats of 3GP, MPEG-4 and WebM according to their different Android platforms, which means that when we want to play the video and movie stored on the computer with Android phone, we will have to convert them to the video format that the Android phones can play and then transmit them using a cable. The other thing is that the Android phones usually do not offer huge internal memory to store the movie and video for us to save the file. Android phone users have been taking much effort in finding a new way of playing video and movie so as to save all these troubles. And now, streaming movie and video to Android phone with Air Playit just caters to your needs. Air Playit is free video streaming software designed for streaming movie and streaming video from computer disc to your Android phone yet occupying no space in the phone. With Air Playit Server running on the PC or Mac and a client app on your Android phone, you can play the video and movie you need with your Android phone on the go via WiFi, 3G or 4G network. 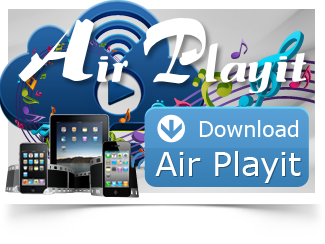 * Download Air Playit and install Air Playit server on your computer (both Mac and Windows versions are free) and Air Playit client app on your Android phone respectively. *Make sure your Android phone is well connected with WiFi, 3G or 4G network. 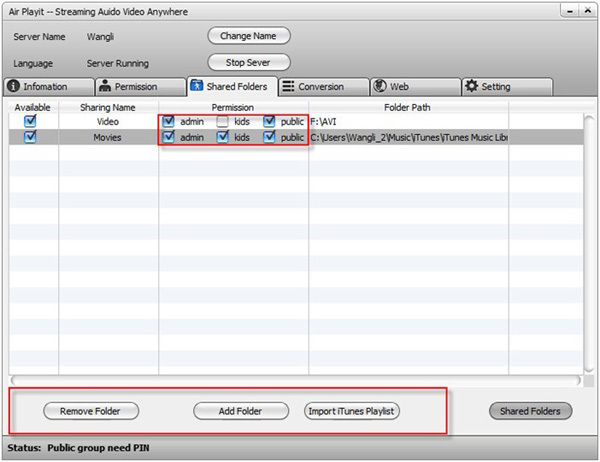 Step 1: Run Air Playit Server on your computer and add target video/movie to "Shared Folders" by clicking "Add Folder". Step 3: Browse the added video folder under your server; choose this video by clicking "Play". Then you may the video/movie on Android instantly. Besides streaming movie/video to Android phone, this free video streaming software can also be used as a great solution to streaming video and music to iPad and iPhone. Just install Air Playit server on your PC/ Mac and the corresponding client app ( iPhone app or iPad app) onto your Apple device, and you can freely play the video and music with you iDevice at anywhere.